Sandra has served in leadership capacities with a number of national organizations including the Board of Directors of the American Society on Aging, the Chair of the Board of Directors of the National Alliance for Caregiving and the Chair of the Business Forum on Aging. She is a Doctor of Education and a nationally-recognized gerontologist with a focus on aging and its relation to business. Sandy’s areas of expertise are focused on global demographic changes and on retirement life stage issues on subjects ranging from retirement finances, family needs and intergenerational relationships, housing and aging in place, employment, health and long-term care, and other transitional topics. Sandy was the founder and Executive Director of the MetLife Mature Market Institute, which was disbanded in June 2013.. (This was a huge loss to the retirement industry – their LTC and other studies were of great use to the industry for education and product development purposes). The Institute was the company’s center of expertise, strategy, and thought leadership on the 50+ market, providing customer insights, content development, research, education, sales support, and visibility for MetLife and its business partners. Prior to joining MetLife, Sandy held senior staff positions with several national aging organizations including the American Society on Aging, AARP and SeniorNet. She has served in leadership capacities with a number of national organizations including the Board of Directors of the American Society on Aging, the Chair of the Board of Directors of the National Alliance for Caregiving and the Chair of the Business Forum on Aging. 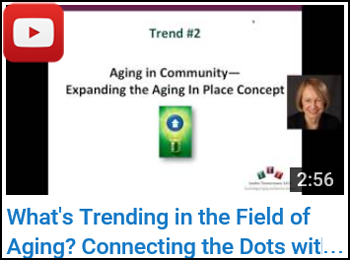 What’s Trending in the Field of Aging: Connecting the Dots with Financial Services. Sandy was a delegate to the 2005 White House Conference on Aging, and holds the Gloria Cavanaugh Award for Excellence in Training and Education, which is presented to individuals who have demonstrated continued excellence in training and education in the field of aging. 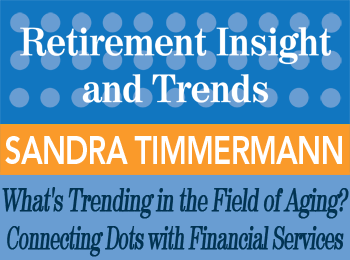 Read summary transcripts of Timmermann’s presentations in the 2015 1st Qtr and 2016 2nd Qtr issues of ‘Retirement Insight and Trends‘. Sandy writes for professional publications and is the Financial Gerontology columnist for the Journal of Financial Service Professionals. She is a frequent speaker on aging issues at national conferences and seminars, and has been interviewed by major media including the Wall Street Journal, the New York Times, USA Today, MarketWatch, Bloomberg and many others. Have Sandra Timmermann speak at your event! 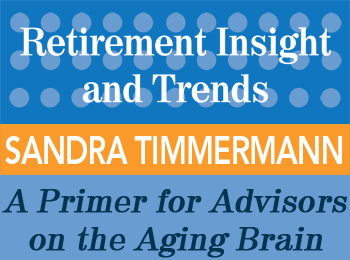 Sandra Timmermann is an experienced speaker and keynote presenter on topics pertaining to retirement and the aging Boomer population. Please contact us today via email or phone 847-686-0440 x102 if you would like to have Michael present at your conference or appear at one of your events, or to receive a free voucher to view a sample of one of our speaker’s work.